A few months ago, I asked you all how spammy you find the Google home page. One of the cleanest home pages available on the internet today... When users see ads of any kind, especially animated ads on Google's home page, it stands out like a soar thumb. So we ran a poll and most people find Google's home page to be in good taste and not spammy. 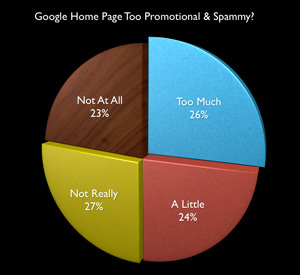 Here is the break down on responses, with well over 200 responses to the question, "Google Home Page Too Promotional & Spammy?" I am not surprised by these results.